Comparable to the pairing of Mounds 32 and 33 is that of Mounds 36 and 37. Mound 36 is a large, square, flat-topped mound located directly east of the central section of Monks Mound. While Patrick’s map shows quite a number of rectangular or square mounds with a fairly consistent east-west or north-south orientation, Mound 36 is aligned slightly east of north, as is Monks Mound. McAdams confirms the Patrick delineation of this mound, since he illustrates Mound 36 as square with straight, well-defined sides, about 15 feet (4.6 meters) high, and with a summit area of between 1 and 2 acres (0.4 to 0.8 hectares). When DeHass reported on the mound in 1869, he stated that the elevated square defending Monks Mound on the east was itself defended by a mound at the southwest corner. 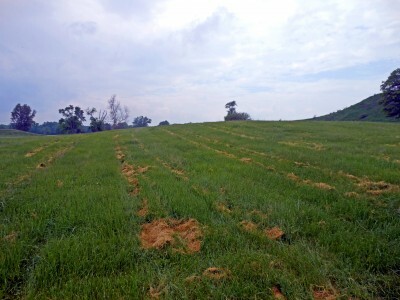 Today no significant elevation appears at the southwest corner; instead, Mound 37 is at the northwest corner. This may have been merely a typographical error. With a base elevation of 130 meters (426.5 feet), Mound 36 is located between coordinates N148-196 and E330-398. This gives a north-south dimension of 48 meters (157.5 feet) and an east-west length of 68 meters (223.1 feet). 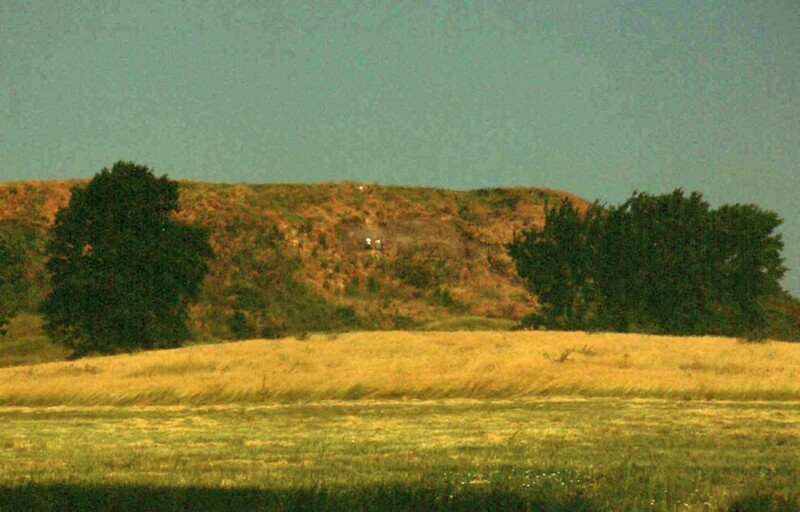 The current top elevation of this mound is 131.7 meters (432.1 feet), indicating a height today of 1.7 meters (5.6 feet). This mound has been extensively plowed and spread out, implying that the base is probably at a lower elevation than the 130 meters indicated by the UWM Map. McAdams (1882) gives a height of 15 feet (4.6 meters) for this mound; Thomas (1894), 20 feet (6.1 meters), and Peterson-McAdams (1906), 12 feet (3.7 meters). The square-to-rectangular outline of this mound is abundantly clear on recent aerial photos. ItisinterestingtonotethatwhileMound36appears on the earlier maps to be nearly square, the present contours suggest a more rectangular shape with the long axis east-west. This is true of other mounds, such as Mound 32, and this lengthening of the east- west axis may be due to the possibility that the predominant plowing over the years has been in an east-west direction.